I’m sitting in a brightly lit classroom, my desk facing front to the teacher and blackboard. The walls of our public high school in the Hermosa community in Chicago are adorned with three posters, a cork board of student work, and chipped, yellowing white paint. I’m fixated on an empty chair behind a desk near me. The day before it had Orlando in it. Outside Kelvyn Park High School in Chicago’s Hermosa neighborhood. Kelvyn Park for the past four years, and he says he’s Mexican. He doesn’t look Puerto Rican to me and in Chicago if you’re Latino and you aren’t Puerto Rican, then you’re probably Mexican. We speak occasionally, but we aren’t friends. Orlando is quiet, but conversational if you take the time to talk with him. His personality has come out little by little through the course of small talk over four years. Sometimes in homeroom, I go over and talk with him when I need a break from whatever gossip my friends are passing. He likes music I’ve never heard of. Screamo and Punk and Goth and other music that isn’t possible without an electric guitar. Music that I called “rock and roll” until someone told me to just say “rock.” Maybe it was him. I can’t remember. I asked him what bands I should get into and he named a few. I asked why he liked them and he explained with a list of references about other artists who made guitar music. References I didn’t catch. I asked him for a list of songs to listen to and he offered them up, excitedly. I told him that I’d check them out and report back. I never looked them up or maybe if I did, I gave one a 10-second shot and then turned it off. Either way, he never got a report. 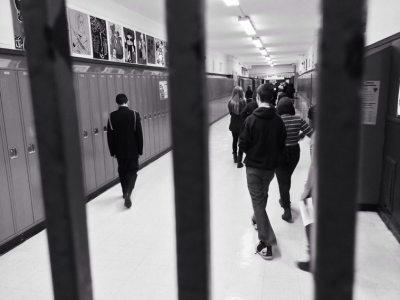 Students walk the halls at Kelvyn Park High School. Orlando and I are in our high school “Scholars Program.” It’s a program for “gifted” students at this underperforming, under-resourced Chicago public school. The program is for the kids who have the best chance to be upwardly mobile. Being in the Scholars Program means you have first dibs at A.P. and honors classes. It means you may be nominated for scholarships you don’t even know about. It means someone in the counselor’s office actually reads your transcripts. My dad used to say the fastest path between two points is a straight line. The Kelvyn Park Scholars Program is that line. On one end is Point A. Point A is us: poor kids on the Northwest Side of Chicago, who, given the right classes and the right teachers and the right amount of attention, might actually make it out. On the other end is point B. Naturally, Point B is at the other end of the line, opposite of Point A, opposite of poverty. Point B is small liberal arts colleges and frat parties and student loans and entry-level jobs in industries our parents never heard of and bottomless brunches and lattes with faux milk and health insurance and code switching and loneliness. Everyone who knew you when you lived at Point A no longer recognize when you get to be Point B.
Graphic (Jack Doppelt/MEDILL) based on data provided by Kelvyn Park High School. At neither point A nor point B is freedom. As I fix on Orlando’s empty chair, everything comes into focus. We are second semester seniors. We don’t have any classes together that semester other than homeroom, but we are both in an after-school tutoring program that’s preparing us for the A.P. Psychology exam in a few months. 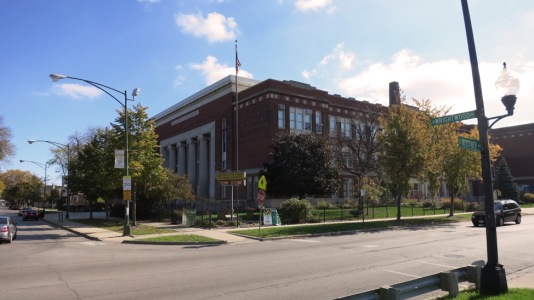 The front entrance of Kelvyn Park High School, located at the corner of Wrightwood and Kostner in Chicago’s Hermosa neighborhood. out of school. I remember her saying he was struggling to get into colleges and find funding because he was undocumented. He decided to work instead. We were scheduled to graduate in four months. The after-school tutoring session is quiet. The classroom feels smaller. Answers aren’t coming from Orlando’s side of the room. I drift out. The classroom is an airplane now. The door is closed and we’re pulling away from the gate. Soon we’ll be 20 thousand feet in the sky headed towards Point B. My boarding pass is a high school transcript with all the right classes and a social security number at the top. I’m at a window seat wearing a gray sweatshirt with DePauw written across the chest. I look across the aisle and Orlando’s seat is still empty. * Orlando’s name was changed to protect his privacy. 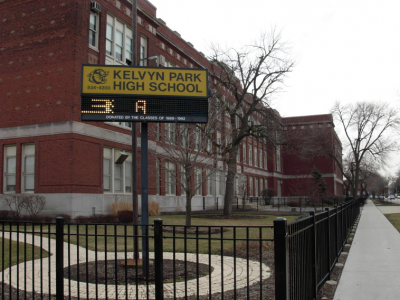 The name and location of Kelvyn Park High School are accurate.